"My favorite part of a song," someone said, "is when everything changes." 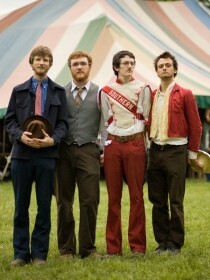 Bombadil swears Elliott Smith made that statement in an interview in 2001. Though they have failed to produce any such interview, the band has nonetheless lived by these words for years; reveling in the unexpected, the improbable, and the serendipitous. 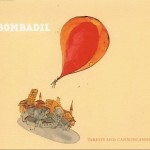 Bombadil set out to make their next record with that familiar spirit, along with a few questions. How many ways are there to laugh? What lies beyond the honeymoon? What if things don't turn out the way you wanted them to? What would a musical postcard sound like? So they sojourned deep into the North Carolina backwoods to Scott Solter's analog oasis to find the answers. They arrived with ambitious arrangements of stomping villages, clattering saxophone militias and soaring strings for songs anchored to the modest tradition of their beloved folk forefathers (knowing sometimes that just a good honest take from the piano bench is all that a song needs). And then, after a few weeks, they left with "Tarpits and Canyonlands," a joyful document that celebrates all the flaws and sorrows of the human condition while capturing the whimsy, spirit, and charm that has enabled the band to win over fan after fan on a relentless four-year tour.